Crock cartoons hanging on the wall of the Reliable Source. After more than 37 years, the "Crock" comic strip by Bill Rechin -- and, for a year, by his son and son-in-law -- came to an end on Sunday, May 20. Rechin was a great friend of the National Press Club, along with his writing partner, Don Wilder. 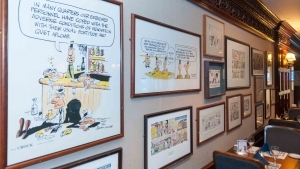 When the club was being renovated in the early 1980s, Rechin drew the oversize cartoons that still hang in the Reliable Source. He did them as a way of boosting the spirits of club members who were forced to make their way through rubble and artificial barriers to get to the bar and dining room. For his efforts and his support of the club and the National Press Foundation (which then was part of the club), Rechin received an honorary NPC membership. Rechin died a year ago and the "Crock" strip was continued by his son, Kevin, and son-in-law, Bob Morgan. But as the story  here relates, it became too much for Kevin to continue. Morgan sent the final Crock strip to several former club presidents. "Here is the final original Sunday Crock. It ran today in 14 countries and in more than 250 newspapers and websites. As many of you know, Kevin and I tried hard to include some Grampy details in this one - from Grout on the bed asleep (aka - Maggie) to Crock's final utterance - quite familiar to us all. While Grammy never wanted to be in "the fiunnies" we snuck her in - looked at what's hanging over the bed. This is also the first time Maggot ever appeared fully dressed (so why not have him dressed to the nines), that Burford and Vern appeared in civies (you still have to wonder if either is bald) and the lost patrol wasn't lost. "This was an outstanding strip for 37+years. While you will still see "best of" strips on Comics Kingdom for at least the next year and in the international papers (and a few US for a month or two), for Kevin and I the hiatus (defined as an interruption in space, time, or continuity) is upon us."